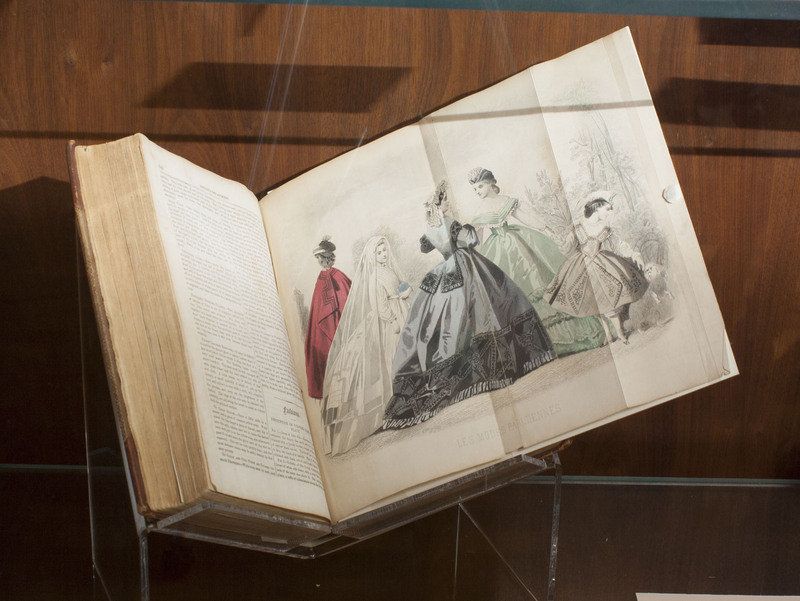 We’re excited to invite Bryn Mawr’s campus and delegates to the Women in Public Service Project to view Taking Her Place today on its final day in the Rare Book Room gallery before we dismantle the exhibition. Taking Her Place has been open since January 28th, and in that time we’ve had some great feedback from alums, students, faculty, and members of the public. 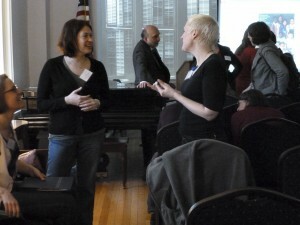 Among the visitors we were able to extend special welcomes to over the course of the semester were attendees of the Women’s History in the Digital World conference, guests of Bryn Mawr College Alumnae/i Reunion weekend, and the Women in Public Service Institute. 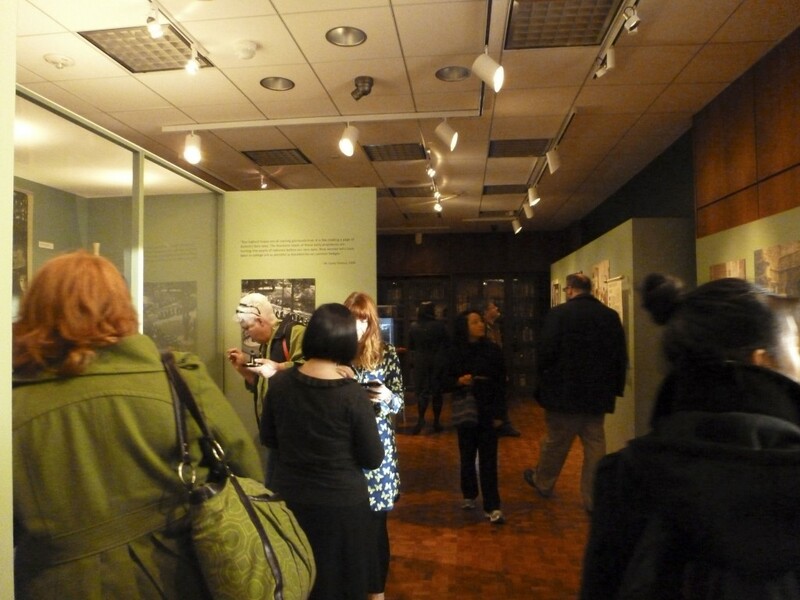 We especially loved hearing stories from the alumnae who came to the exhibition, some of whom shared recollections of people and events that are featured in Taking Her Place. We spoke with President Emeritus Pat McPherson about her memories of Margaret Bailey Speer, a graduate of the class of 1922 who went on to lead a Yenching Women’s College in China until the second World War forced her return to the States. 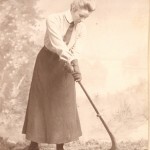 (She subsequently returned to the area as headmistress of the Shipley School just across the street from the College, and maintained a relationship with this institution for the rest of her life.) We learned many new things about the school’s history from our enthusiastic attendees. For those who would like to revisit the exhibition, or who never had a chance to view it in person, we’re delighted to announce that an online version is now posted on our website! browsing layout designs from before the show was constructed, links to additional oral history interviews, and images that we did not have space for in the gallery. We think it makes for an equally good, if not even better, viewing experience. The exhibition can be viewed here and it will remain on our site indefinitely. Thank you to all who were able to view Taking Her Place, and we hope that those of you who didn’t have the chance to see it in person will enjoy it as a digital resource! As always, the co-curators from The Albert M. Greenfield Digital Center for the History of Women’s Education are happy to take questions, either about the process of envisioning and executing the exhibition or on the history of the college and women’s rise into the public sphere through education. 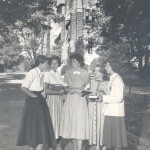 If you’re curious to learn more about the history of women’s education and of Bryn Mawr College, take a look at some of the other exhibits and items from the collection that we feature on our site and keep an eye on this blog. Please write to GreenfieldHWE@brynmawr.edu, or follow us on Twitter @GreenfieldHWE to learn more about what we have planned next. Books on display in Taking Her Place as part of the section on Gender and Intellect. When we were collecting material for the exhibition Taking Her Place, it was a challenge to find items that would tell the story of women’s ascent into higher education without relying too heavily on only text. 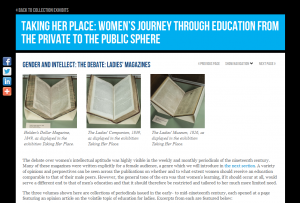 Periodicals such as The Ladies’ Companion and The Ladies Garland are some of the best resources that we have for gauging society’s attitude towards female intellectualism, as the articles they featured show the developing shape of public opinion. 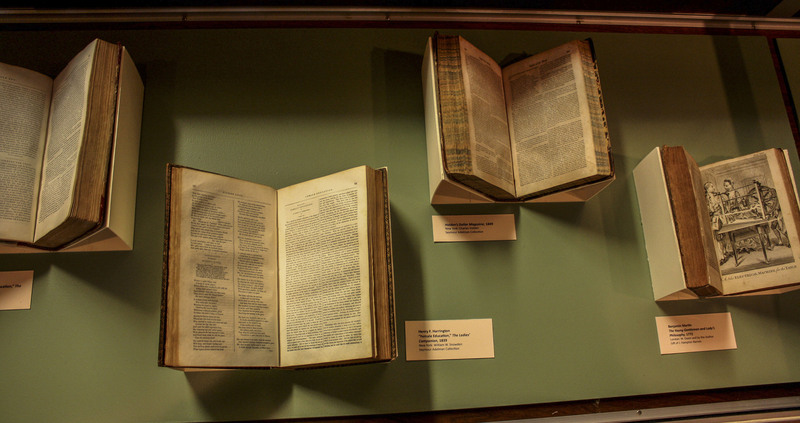 However, they do not make ideal exhibit items: arranged behind glass, the books are difficult or impossible to read at length, and an exhibition dominated by unreadable books makes for a bland visual display. Therefore, we found ourselves with many fascinating textual objects that illustrated the story we wanted to tell but did not have a place in the exhibition. Many of those items hold an important place in the narrative of women’s rise into the public sphere, and as we move into the final week of the exhibition, we will highlight a few of them on this blog in order to more fully flesh out the themes that we address in that space. We will post more material in conjunction with the release of an online version of the exhibition, which will take the form of a digital exhibit like the others on our website. 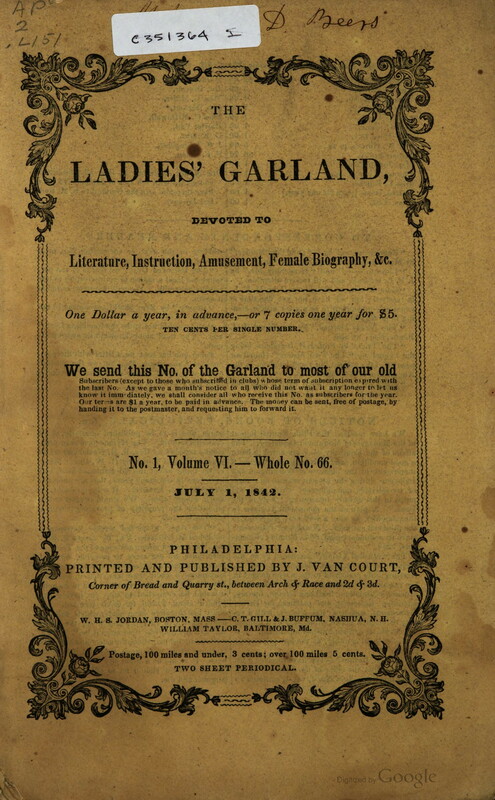 Title page of the July 1, 1842 issue of The Ladies’ Garland. Click for an enlarged view. One item that we would have like to include is this article from an 1839 issue of The Ladies’ Garland, entitled “Proper Studies for Ladies,” which touches on many of the themes common to the opinion pieces of the era. 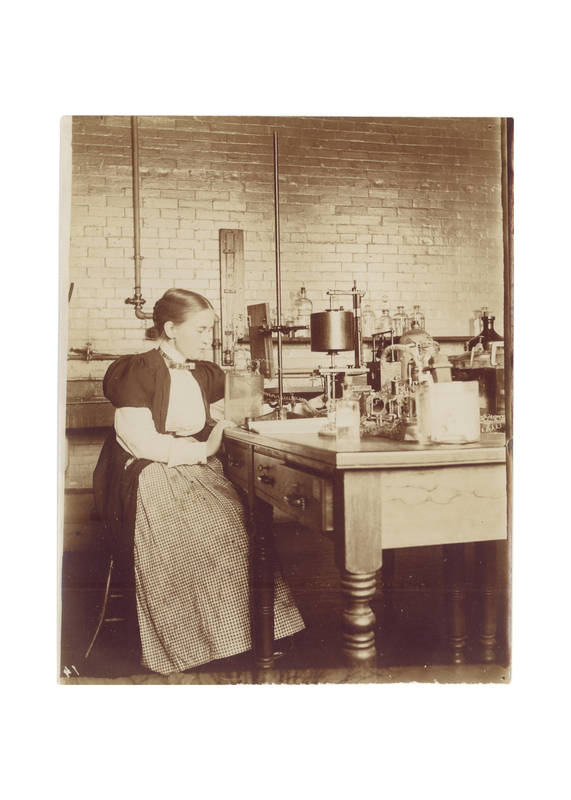 As higher education for women appeared on the horizon, society grappled with what forms of knowledge would be appropriate for a woman to pursue. In this article, the anonymous male author juxtaposes the intellectual and commercial realms of society and seems to feel dubiously about women’s place in either. Page 31 of The Ladies Garland, Volume II, 1839, including “Proper Study for Young Ladies.” Click for enlarged view. While I was combing through contemporary journals and magazines to get a sense public opinion across the era, this piece stood out to me as unusual. It struck me as fairly advanced for 1839 that a male author would take for granted that intellectual study was both available to and appropriate for women. However, though it seems progressive in its advocacy for ladies’ serious study, there is a strong conservatism at its core that I will devote this post to exploring. This paradox is characteristic of many of the articles that Jennifer and I read while researching for the exhibition: I’ve learned that progressivism and conservatism often move together in strange ways as society adjusts to major changes, and are rarely as separable or black-and-white as I would have initially expected to find them. It fascinates me that the author is certain at such an early date that any woman who wished to could gain access to intellectually stimulating study. “This is a large volume,” he writes of such pursuits, “that is open to all.” However, “In vain…does nature present her miracles to the generality of women,” as if the study of natural science was so available that women would have to work hard not to be exposed to it. It is unclear exactly how he expected them to engage with such material, considering the state of formal schooling at the time: Oberlin College, the first co-educational college in the United States, had been founded only six years earlier, in 1833. 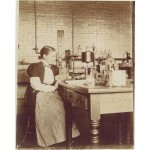 The only other form of secular post-secondary education for women at the time was the seminaries that offered training for a teaching career, of which there were eight in existence nationwide in 1839. Since formal higher education was hardly widespread, the author therefore seems to imagine that women should be pursuing academic curiosity in a self-guided capacity. This quotation frames the article by asserting the value of substance over appearance, which is consistent with the article’s rejection of ornament—but, notably, it also situates the matter within the context of women’s appeal to others: it lays groundwork for an article that will posit female intellectualism as a tool for attraction; in short, another form of ornament. The author’s thesis is that because they fail to take advantage of the intellectual richness available to them, most women thus reduce their prospects for good matches by offering only conversation which is vapid and unappealing to respectable men—who are, of course, the true victims of this unfortunate situation. “What preservation is there against weariness and disgust,” he ruminates, “in the society of women of weak and unimproved understandings? In vain do they endeavor to fill the void of their conversation with insipid gaiety; they soon exhaust the various funds of fashionable trifles, the news of the day, and the hackneyed compliments; and are at length obliged to have recourse to scandal.” The true goal, therefore, of women’s learning, is to make them into better companions. The article suggests that the idea of what would corrupt women was changing. The previous belief was that knowledge itself would corrupt, whereas here it is the wrong kind of knowledge that is to be feared—In other words, a misuse of intellectual powers. Indeed, language of misuse, in the form of waste and misdirected spending, permeates the piece. Three examples come to mind: the phrase “in vain” appears three times including the epigraph, each instance describing a woman (if we count the personified Nature) fruitlessly expending effort in order to appeal to another. The unlearned lady whose foolish prattle fails to impress “soon exhaust[s] the various funds of fashionable trifles.” (Italics mine.) And, at the end of the article, the author bemoans the “waste of intellect which is caused by the dissipation of the town.” Instead of such wasteful behavior, he suggests that women “collect” (ideas from the best authors) rather than spend. 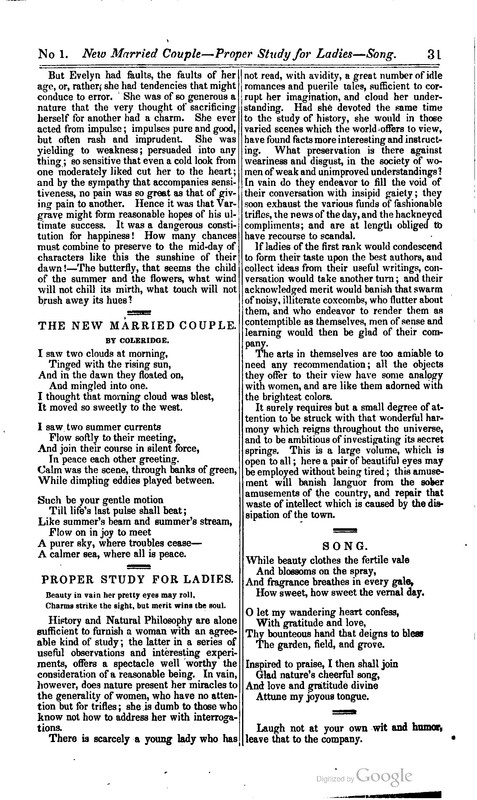 This language underlies his portrayal of women consumed with the trivial trappings of femininity, especially those that could be linked to commercialism and had an air of cheapness: they were attracted to the “fashionable trifles” that were being marketed to them (in magazines just like this one), and even their trivial conversation (“the news of the day,” “scandal,”) is ephemeral and probably harvested from the gossip columns. 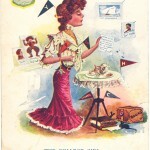 The Ladies’ Friend, another popular periodical at the time, interspersed fiction and opinion pieces with large pull-outs like this one depicting the fashions of the season. Considering all of the negative associations that he establishes between women and commercial economy, perhaps the feminine ideal that the author paints (studious, yet passive, and economically disengaged) is a paranoid reaction to women’s growing economic power as a class of consumers. He manages to exclude women from both the commercial and intellectual realms: he blames them for partaking in the former, and suggests that they would be welcome in the latter if only they had the virtue to earn themselves a place there. And do they? He writes that “scarcely a young lady” exists who has not fallen into the pitfalls of cheap and entertaining literature. Though he idealizes the woman who devotes her time to academic study, he speaks of such women as if they are in practice an impossibility, a mythical being. Women’s real practices are demonized, and the hypothetical woman who “gets it right,” so to speak, doesn’t exist: perhaps he is so threatened by female agency that he is compelled to write them out of all public realms. So, if they can exist productively nowhere in the public sphere, what use are women to society? The one role that the author feels comfortable ascribing to women is that of passive indicator of the state of society. He ends with the proclamation that the “amusement [of proper study] will…repair that waste of intellect which is caused by the dissipation of the town,” as if women’s unintellectualism is a symptom of a societal disease. He implies that the health of society can be read through the quality and state of its women, positing them as a kind of diagnostic tool rather than as a class of people. This article, one of many that we would have liked to include more prominently in Taking Her Place, demonstrates several themes that are common to the opinion articles of the age. It shows a surprisingly advanced advocacy for women’s learning, while still clinging rigidly to the traditional role of the subordinate an ornamental woman. It also conspicuously lacks an argument for education for its own sake: it was much more common to posit education as a means to serve some aspect of traditional femininity, such as aptitude for motherhood or (as seen here) male companionship. The juxtaposition of commercial and intellectual pursuits was also a major topic of writings of the time, especially with an air of blame towards any woman who demonstrated too much affinity for the former. Combing through these books and journals was a fascinating activity and gave us a broad sense of the complexity of changing opinion across an era. 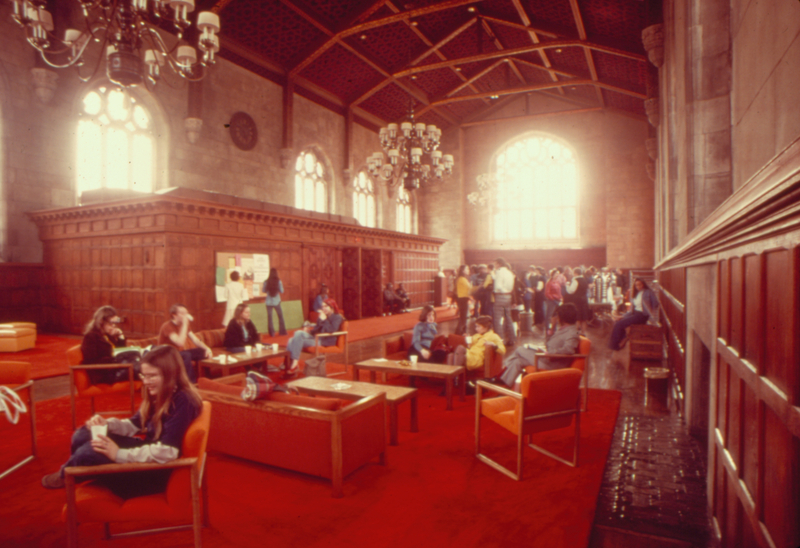 Anybody who is interested in learning more, or in reading other articles from our wide collection, is encouraged to come visit in Bryn Mawr Special Collections in Canaday Library and browse the collection for themselves. 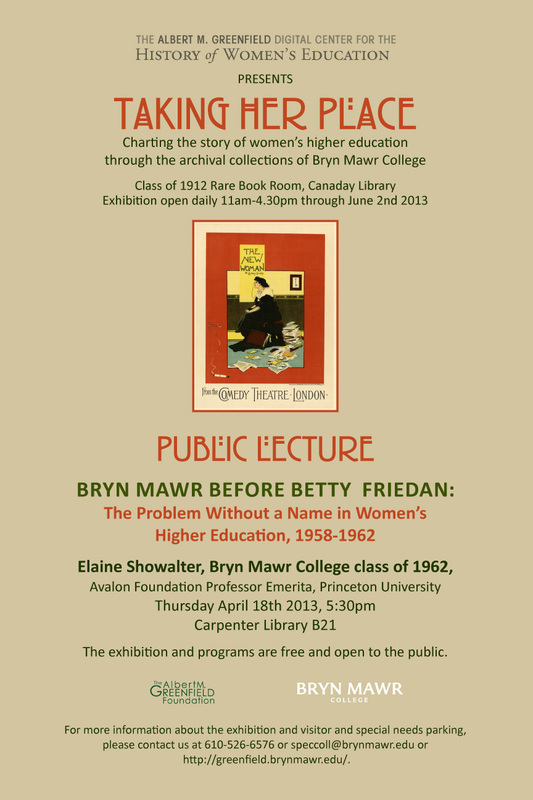 This is a reminder that The Albert M. Greenfield Digital Center for the History of Women’s Education will host Professor Elaine Showalter, Bryn Mawr College class of 1962, Avalon Foundation Professor Emerita, Princeton University at Bryn Mawr College tonight. This is part of the Friends of the Library exhibition program in which we also hosted Professor Helen Horowitz to open the show. 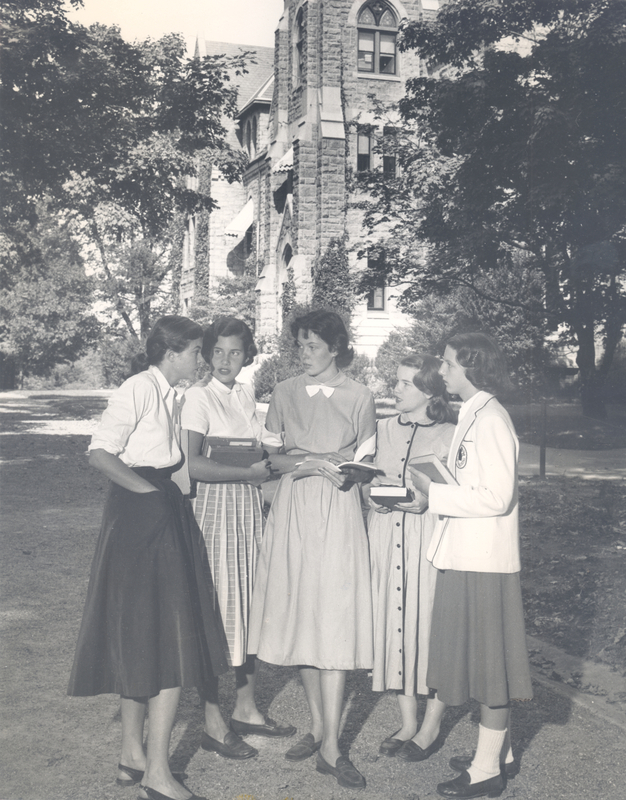 Taking Her Place will run until June 2nd 2013, finishing with a series of dedicated tours as part of Alumnae Reunion Weekend. 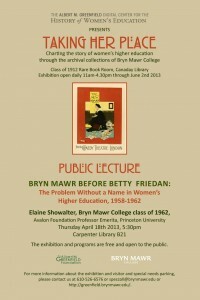 Professor Showalter’s talk is titled: “Bryn Mawr Before Betty Friedan: The Problem Without a Name in Women’s Higher Education, 1958-1962″. The talk will be held on Thursday April 18th 2013 at 5:30pm in Carpenter Library B21. Professor Showalter’s lecture will be followed by a reception at the Taking Her Place exhibition, Rare Book Room Gallery, Canaday Library, at 6.30pm. All are welcome to attend. 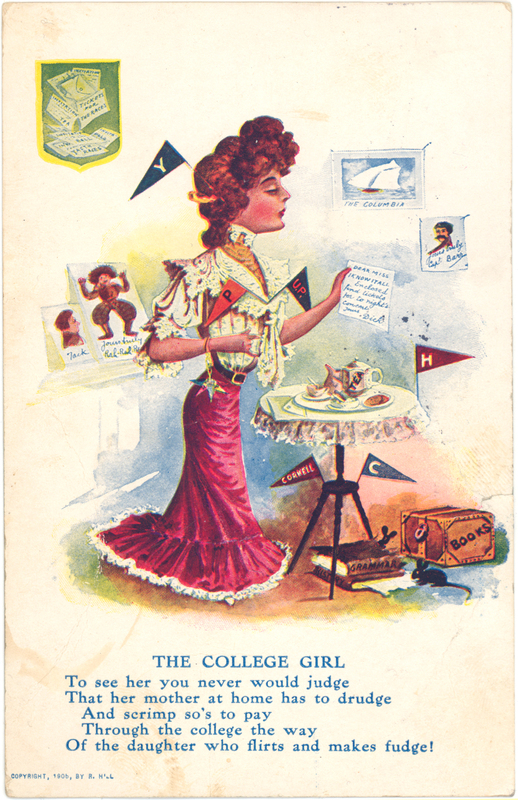 The Albert M. Greenfield Digital Center for the History of Women’s Education is proud to announce the official launch of its website! We’ve been in beta for some time now, and while the site continues to grow, we can now proclaim to you all that we are live and ready to receive your comments…. The past year has been one of exciting growth for The Albert M. Greenfield Digital Center and we are delighted to finally share the fruits of our hard work with you. 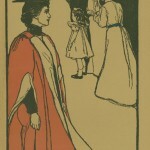 The website will serve scholars in the US and across the world by providing free, open access to materials on the web related to the history of women’s education. We have digitized a variety of our own resources and built partnerships with other colleges to feature related original sources in their possession. An example of this is our collaboration with Dr. Anne Bruder’s class at Berea College. Dr. Bruder (editor of Offerings to Athena and Advisory Board Member) challenged her class to create a digital exhibit reflecting on the gendered histories of Berea College (the exhibit can be found here). 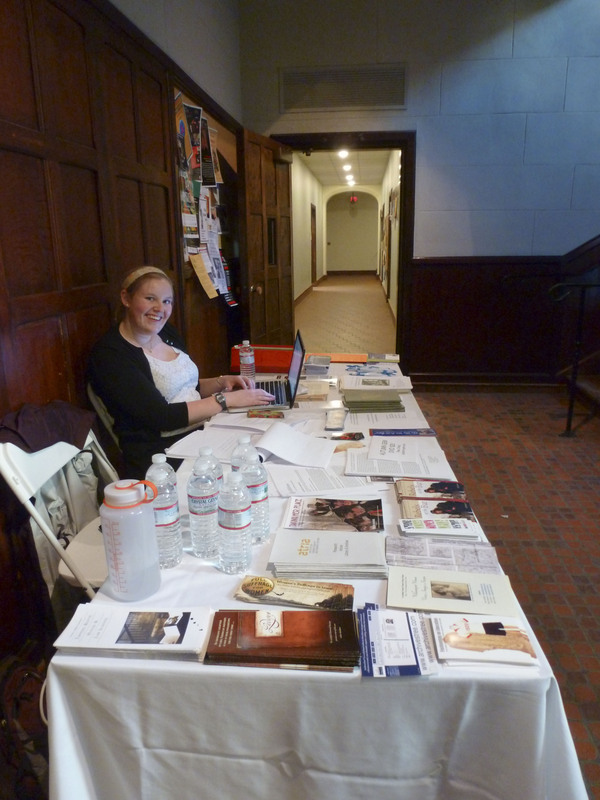 The website also features thematic exhibits on past alums, such as Margaret Bailey Speer, lesson plans created by Temple University students as part of the Cultural Collaboration Fieldwork Initiative, and current Bryn Mawr undergraduates’ work on the scrapbooks created by students in the early years of the college. We are focusing on digitizing prominent or unique items in our collections which will be freely available for teaching, research or general interest to users across the world. Evan McGonagill (BMC ’10) is a Research Assistant working at the Center, focusing on researching the collections and is in charge of the social media presence of the Center. (Click here to see the Center’s team and click here to see the Advisory Board members). 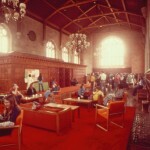 The work of the Center continues to be overseen by Eric Pumroy, Director of Library Collections and Seymour Adelman Head of Special Collections; and Elliott Shore, Chief Information Officer and Constance A. Jones Director of Libraries and Professor of History. As part of the launch of the site, we are announcing the second annual essay competition, again kindly sponsored by the Friends of the Library. 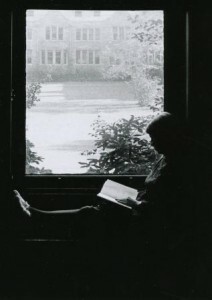 The theme is ‘Transformations: How has the Bryn Mawr College experience made you the person you are today?’ Further details on the competition can be found here. Our first exhibition, Taking Her Place, will be hosted in the Rare Book Room gallery in Canaday Library, Bryn Mawr College, from January to June 2013. 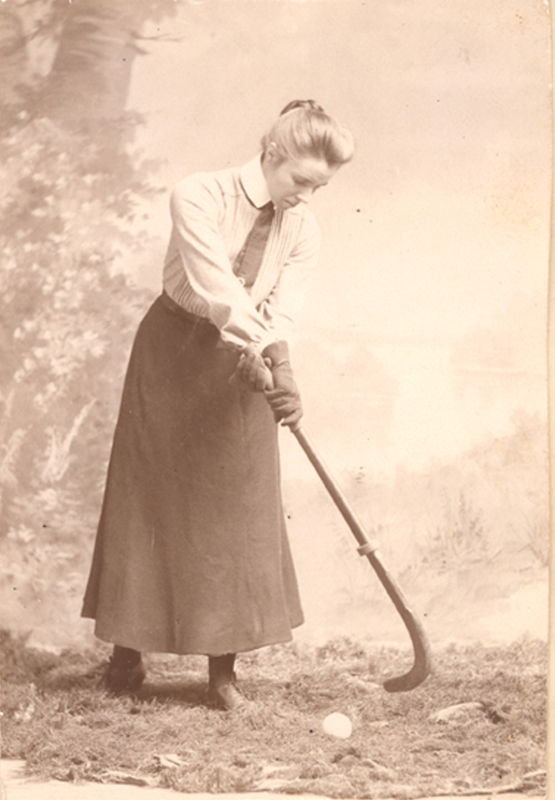 Given the intense scholarly interest in the lively field of women’s educational history, we feel the exhibition will be a welcome addition to exploring the history of women’s reading, learning, scholarship and their battle to take their education and expertise from the private to the public sphere. It will also be a way to visually narrate the journey many women traveled to achieve their ambitions of becoming learned women.This show will explore women’s worlds of reading, learning, educational attainment and entry into the world of work and the public sphere. 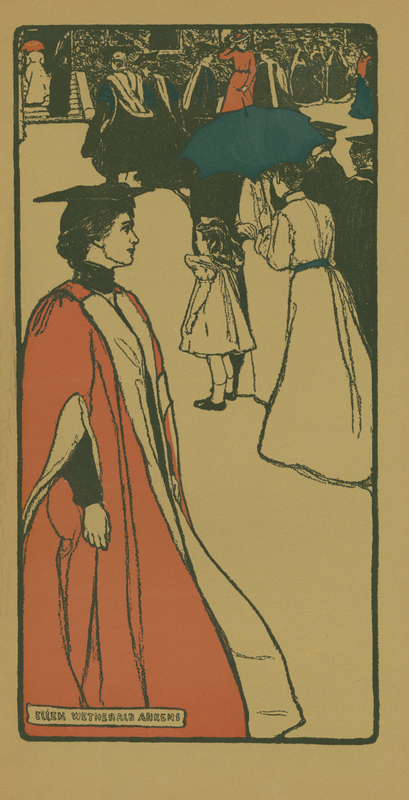 The exhibition will be launched by Professor Helen Horowitz, renowned historian of women’s education, biographer of M. Carey Thomas and one of the keynote speakers at the ‘Heritage and Hope’ conference in 2010 which celebrated the 125th anniversary of the founding of the college. Her talk on January 28th 2013 will be on “Reading, Writing, Arithmetic…and Power: Education as Entry to the World”. On Thursday April 18th 2013 Professor Elaine Showalter, Bryn Mawr College class of 1962 and Avalon Foundation Professor Emerita at Princeton University, will also be coming to give a speech as part of the exhibition program. Please check back here for further details on these exciting events. A digital version of the exhibition will be made available online after it closes. The exhibition is jointly curated by Jennifer Redmond and Evan McGonagill. We are creating ‘Taking her Place’ with the assistance of our colleagues in Special Collections, Eric Pumroy, Brian Wallace, Marianne Hansen, Lorett Treese and Marianne Weldon, with the digital expertise of Cheryl Klimaszewski and Jessy Brody. Finally, we are also announcing the first Call for Papers ‘Women’s History in the Digital World’, to be held at Bryn Mawr College, Friday 22nd and Saturday 23rd March 2013. 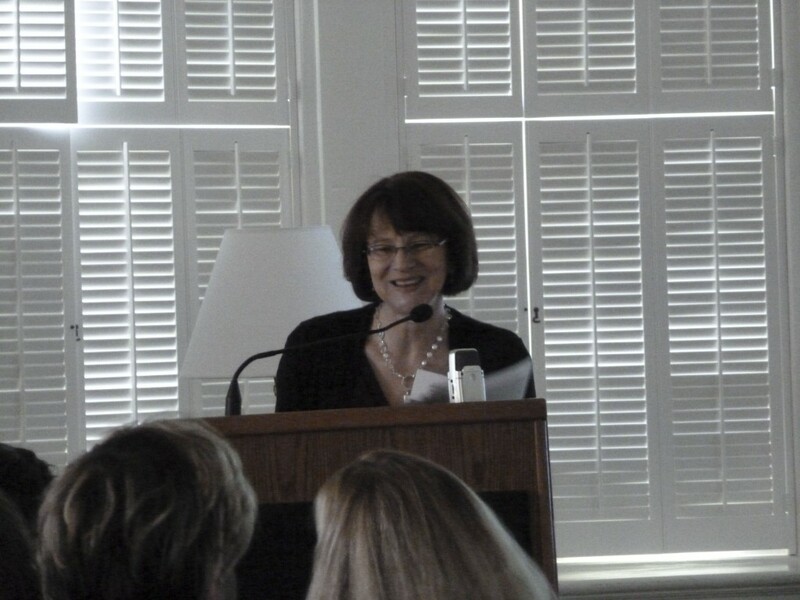 We are honored to have as our keynote speaker Professor Laura Mandell, Director of the Initiative for Digital Humanities, Media, and Culture and a Professor in the Department of English at Texas A&M. 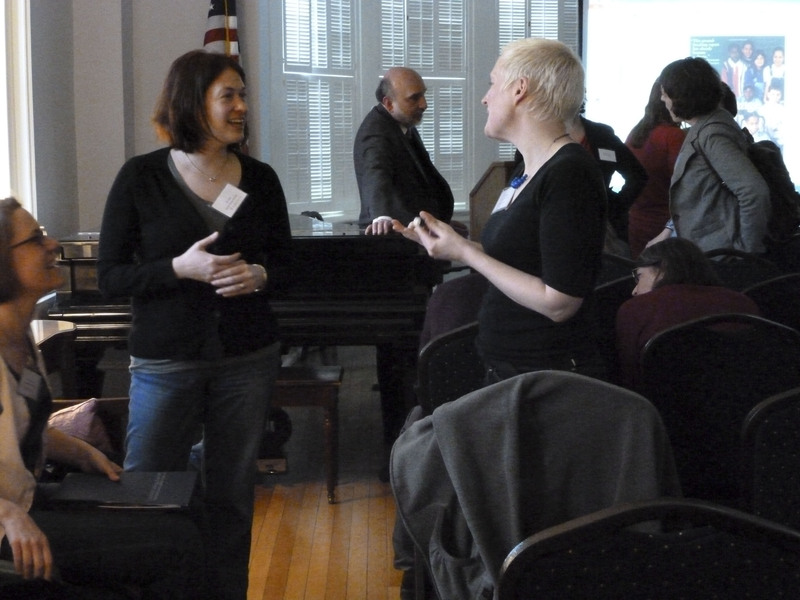 The conference will bring together scholars working on women’s history projects with a digital component, exploring the complexities of creating, managing, researching and teaching with digital resources. We will explore the exciting vistas of scholarship in women’s histories and welcome contributors from across the globe. This will be the first conference held by us, but hopefully this will become an annual event. We wish to bring together both experienced and newer scholars in the world of digital projects on women. Watch this space for further details! There will be other public events throughout the Spring so please check back regularly at http://greenfield.brynmawr.edu/ and follow us on Twitter (@GreenfieldHWE). 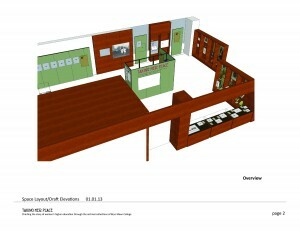 Announcements will be made also through the Friends of the Library Facebook page.